Parker's Barkers: Lots of Adventures! On a recent trip to the Sarasota area, I saw this sign in a business complex and could not resist taking a picture. 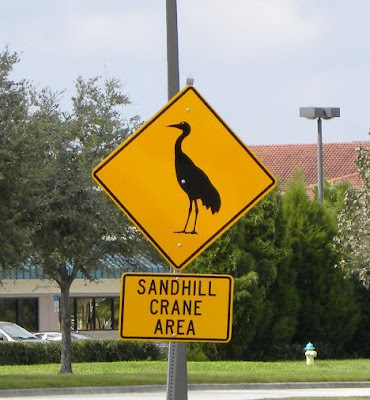 Sure enough, just down the road we saw several Sandhill Cranes brunching on seeds and insects along the side of the road. 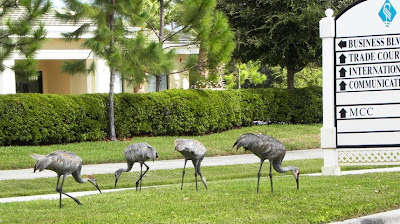 Sandhill Cranes are huge birds - over 4-feet tall. 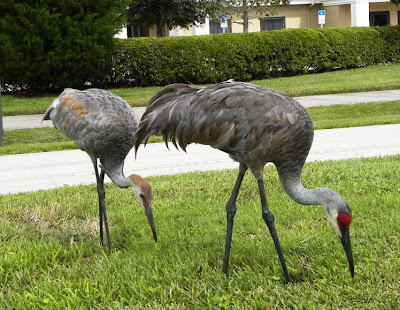 The crane in the foreground with the bright red forehead is a mature adult while the smaller bird in the back is a youngster. 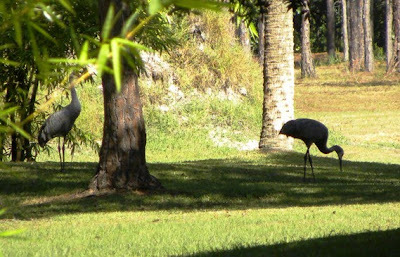 The endangered Florida cranes live here year-around and because they are protected, the numbers are increasing nicely. The very endangered Whooping Cranes look like white Sandhill Cranes and will probably become extinct during my children's lifetime as there are only about 200 birds left. I would love to see and photograph one, but will probably never get that chance. 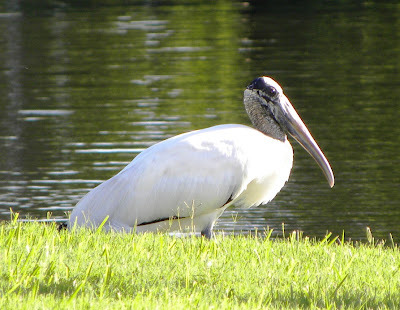 Another endangered bird is the Wood Stork. I've seen quite a few around town as they are passing through on their way to their winter breeding grounds. 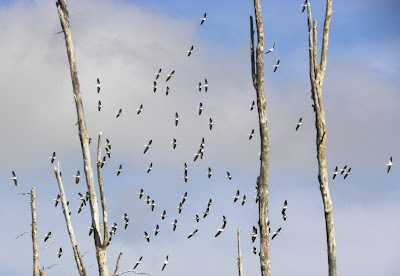 Last year, many storks nested at Corkscrew Swamp, but they fear the storks will not return this year because there has not been enough rain. The Corkscrew Swamp Sanctuary is one of our favorite places to visit. (Thank you Beth and Warren for introducing us to this beautiful place!!) The 2-mile boardwalk weaves through the largest remaining stand of ancient bald cypress trees in North America. Every time we visit we see something new - and our recent visit was no exception! 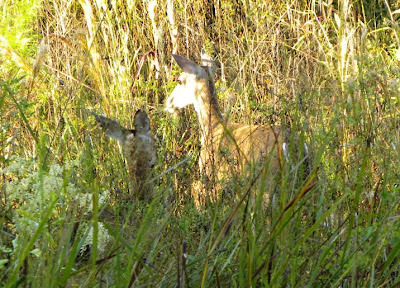 As we entered the trail, two deer crossed right in front of us. We knew this walk was going to be special! We saw several raccoons along the trail. 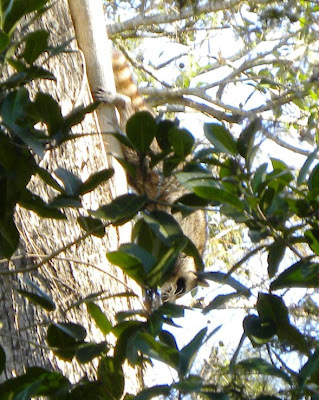 This one was scampering down from high in a tree. 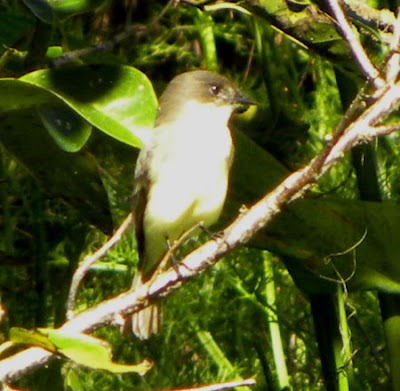 Our goal this year is to photograph more of the smaller birds here in Florida - not an easy task. This Pine (or is it a Palm?) 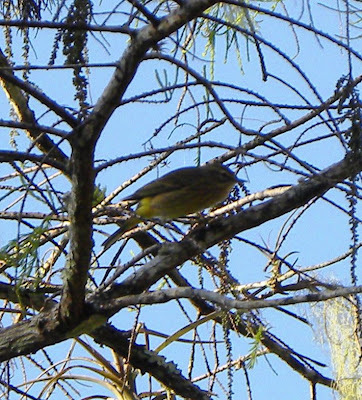 Warbler hid in the shadows of the tree. I still love the larger birds - and they are easier to see, identify and photograph. 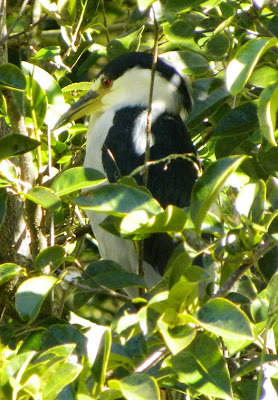 This is a black-crowned Night Heron. 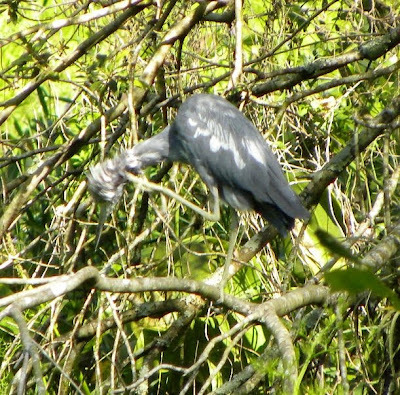 The Little Blue Heron is all white as a youngster, becoming blotched with blue-gray as it changes to its adult plumage. This little guy must have been bothered by the mosquitoes. As I was leaning over the railing taking this picture, Bill yelled "There is a fox heading right at you!" Next thing I know, something runs right between my legs - hitting my ankles. It was a grey fox that was spooked by an alligator and was running down the boardwalk at 80-miles an hour! I've never seen a grey fox and would loved to have had the presence of mind to quickly get a picture - but I didn't and he was moving so fast, it probably wouldn't have turned out anyhow. He ran quite a distance before jumping off the boardwalk (obvious by the screams, followed by loud laughing and talking further down the boardwalk) and several groups got the rare opportunity to see him. 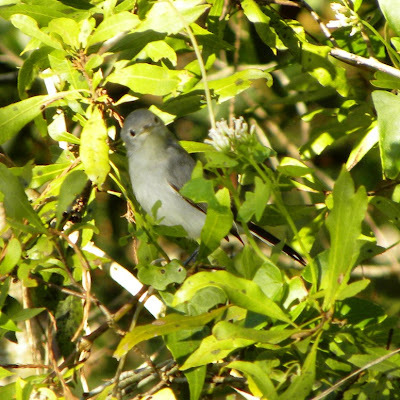 This Blue-gray Gnatcatcher has an almost comical, puzzled look. 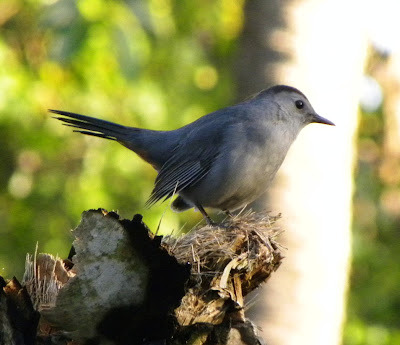 I like this picture of a Gray Catbird better. He was definitely posing for me! This is an Eastern Phoebe. A volunteer on the trail pointed him out to us. They are just arriving here from their summer in the northern United States and Canada. 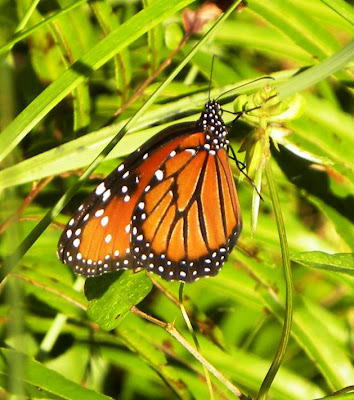 We always see lots of butterflies at Corkscrew. This one was small - only a couple of inches from wingtip to wingtip. I may have to get more guide books so I can identify them. 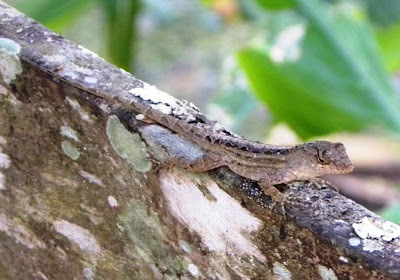 The Brown Anole were everywhere! I love the way this cute little guy blends in with the lichen on the wood railing. There were lots of Bald Cypress (sometimes called Swamp Cypress) with their round, green seed cones. 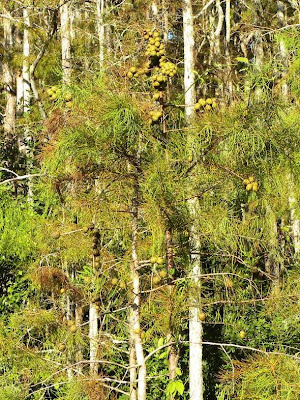 Bald Cypress trees are deciduous - losing their needles in the winter - which is why they are "bald." 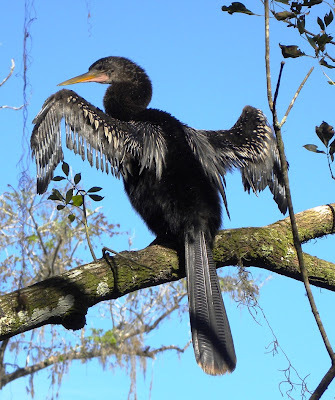 We did not see very many wading birds on this trip to Corkscrew - but we did see a couple of Anhinga - large black waterbirds that live here year-round. This one was drying his wings in the sun. 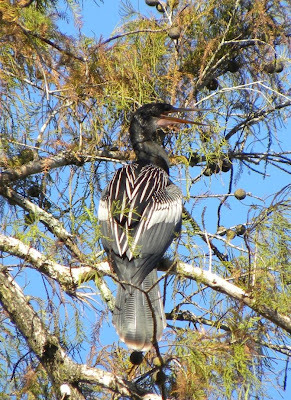 My book says Anhinga are usually quiet - but that is not my experience. They have a loud, raspy call - and this one was making lots of noise! One of the guides at Corkscrew told us to look for Sandhill Cranes in one of the yards near the sanctuary. She told us the owner feeds them and they return every year. Sure enough - we found the yard and the cranes. For our next adventure on an especially hot morning this week, we decided to find a Geocache that we knew was hidden at the Estero Bay Preserve State Park. We had a Travel Bug that we brought all the way from Colorado to put in a cache here in Florida. Last year when we hiked at Estero Bay, the dry trails were fairly well marked and maintained and we met a geocacher locating a cache on a platform beside a huge, picturesque pond. That's where we decided to put our bug. We had already been to the gym and had our workout for the day and since it was hot, we wanted just a short - maybe a mile - hike before heading to the pool. We knew the area - so I didn't even download the trail map. I also did not look at the geocache map. All I had were the cache coordinates. We happily headed north even though the GPS indicated the cache was west. After all - we knew where we were going and we were sure the trail turned to the left up ahead. Long story short, we quickly lost the trail and found ourselves hiking in high weeds and black, smelly mud that made disgusting sucking sounds with each step. The black flies, mosquitoes and those nasty bugs that dive bomb into your ears were terrible! Still we figured the trail must be just ahead - so we kept going. It was hot and the humidity must have been 200%. As miserable as the walk turned out to be - we saw some great birds, making it all worthwhile. 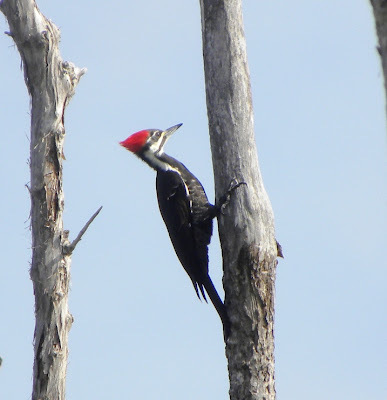 This is a Pileated Woodpecker - one of my favorite birds and the first one I've ever seen completely in the wild - outside a preserve. He was gorgeous! 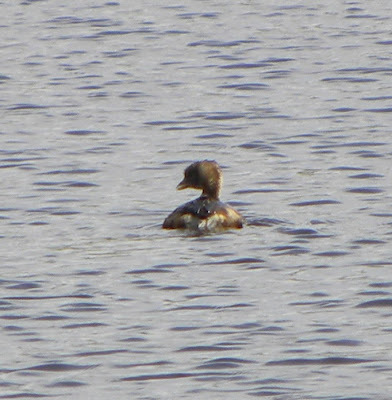 We never made it to the picturesque lake of our memory - but did see this lone Pied-billed Grebe on a smaller pond. 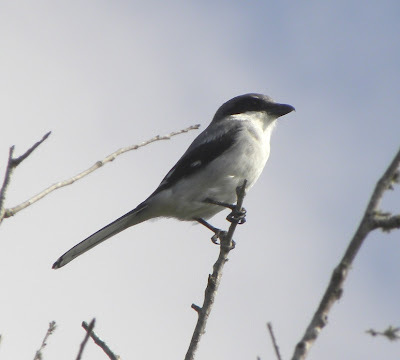 We often see Loggerhead Shrikes here in Florida. This one was keeping a keen lookout atop a dead snag. 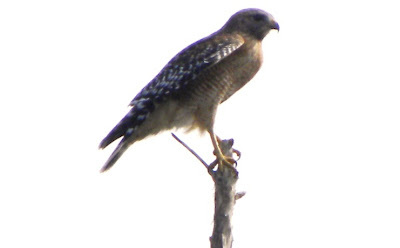 We watched several Red-shouldered Hawks but they insisted on sitting between my camera and the sun (which by now was high in the sky and even hotter!) so all my pictures are dark. I removed the background in this picture so you can see the bird. Look at all the White Pelicans - returning for the winter. It was beautiful when we looked up - but we spent most of the time looking down to make sure we did not step on any snakes. We finally found the cache. The coordinates we had were not for the one we remembered at all - but were for an easy one just a short walk west of the entrance on a well-marked, dry trail. We placed the travel bug, picked up a Geocoin and a Jeep Bug - and headed back to the car - where we spotted a beautiful Bald Eagle. He took off before I had a chance to get a picture - but we got a great look at a beautiful bird. By this time it was noon - we were hot, wet, dirty and tired - but I was thrilled with our glimpse of wild Florida - one I would not have seen if I had remembered a trail map. I'm taking one next trip anyway.